What Makes This Curling Iron Effective on Short Hair? Are you having trouble curling your shorter hairstyle but your tight budget won’t let you splurge on a fancy curling iron? According to many users of the Revlon 3X Ceramic Tapered Curling Wand, there may just be an affordable solution to your short hair styling needs. We were certainly intrigued enough by this curling iron to take a little closer look at it. Come take a look at it with us as we examine whether or not it can effectively be used on short hair. 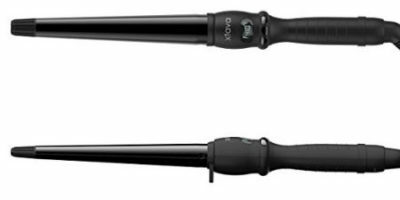 This curling wand can be set at one of 30 different heat settings between 300°F and 420°F. That is the exact type of versatility you need when curling short hair. 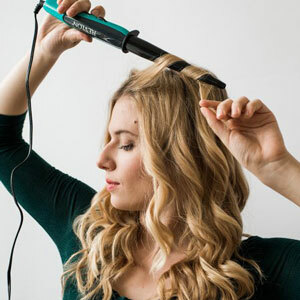 When you combine the multiple temperature settings it has with its unique tapered barrel design you can make many different types of small and medium-size curls with the Revlon 3X Ceramic Tapered Curling Wand. Among its better features is its triple coated ceramic barrel. This allows your hair to slide across it easily as you are curling it and it does not build up harmful static electricity while doing it. Not only has Revlon taken the safety initiative to include a heat protective glove with this product but it also has a built-in automatic shutoff switch and includes a heat-resistant barrel cover. This is also a very travel-friendly curling wand. Since it is dual voltage capable you can use it in just about any place that you travel to in the world. It has a standard size 8-foot power cord with included swivel end too. For one its very versatile tapered barrel design is perfectly matched for short hair. It is approximately ½” at the tip and it widens out to about 1 ¼” as it approaches the handle. This means you can curl even very short hair with it. The multiple heat settings are perfect for short hair too. There is no such thing as a preferred heat setting for all types of short hair. This Revlon curling wand can be set at the perfect temperature for curling fine, thin, medium, thick and coarse types of short hair. Revlon has chosen to back this product up with a very nice warranty which is surprising given its low price point. The 3-year warranty it comes with is much better than most of the curling irons you will find in its price range. What do we think is disappointing about this curling iron? We are not big fans of heat settings that are not digitally selected for greater accuracy. This curling iron simply uses a marked dial that you use to select the heat setting with. Another drawback that was pointed out by many users is that the heat setting dial is also located in a bad place. Because of this you can easily accidentally bump it and change the temperature. 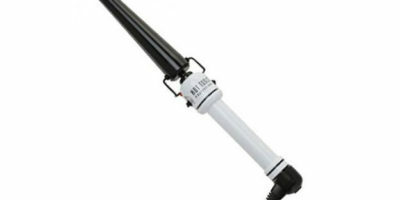 Overall we really have to say we like this Revlon curling iron. We think it is loaded with some great features for the low price it can be bought for. Its tapered ceramic coated barrel and multiple heat settings make curling your short hair very easy. If Revlon would switch to a digital temperature readout and selection this would be a truly amazing product for the affordable price you pay for it. It’s definitely a curling iron worth taking a closer look at when you are shopping for a new one to use on your short hair. Best-Selling Curling Irons for Short Hair!